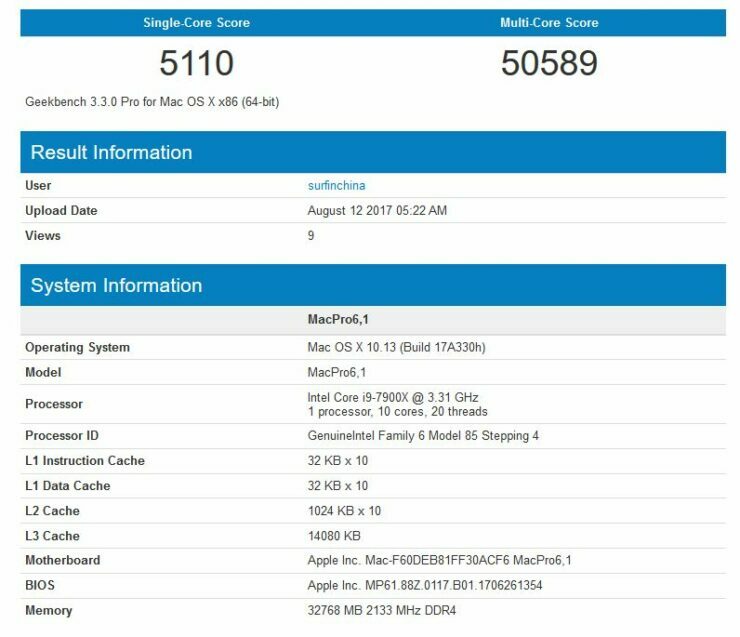 Update: Debunked, the Geekbench score appears to be of a Hackintosh. Apple Mac Pro and iMac Pro test machines with Skylake based Intel Core i9-7900x benchmarks? 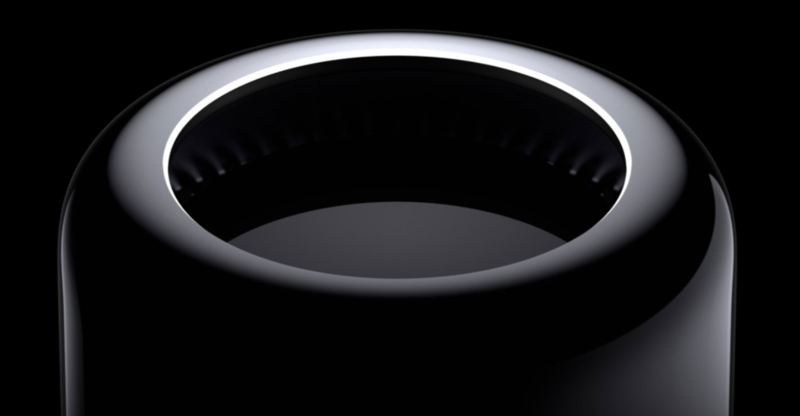 Keep in mind however, that Apple has not officially announced a revamp of the Mac Pro. While it has officially announced that it will be bringing “up to 18 cores” to the iMac Pro lineup, it did not say the same for the Mac Pro lineup. Therefore, it is pretty interesting that the first entry we have is apparently of the Apple Mac Pro. Geekbench is one of the more popular testing suites out there and if you aren’t careful, it will automatically upload results onto its database. Whenever a new CPU or GPU is released, you can pretty much count on somebody screwing up and slipping the results onto the database. Sometime ago Apple more or less announced that it would be embracing Intel’s new Core-X lineup (all the way up to 18 cores). The new Skylake architecture and the presence of 512 AVX will also help sell the ‘pro’ portion of the Mac and iMac Pro. It has one of the highest scores we have seen with this processor scoring 5110 on the single core bench and 50589 on the multi core bench. That is pretty much linear scaling as far as CPU cores go. This particular configuration was running 32 GB of DDR4 RAM. The original entry can be found over here. Up next we have the iMac Pro, the original entry of which can be found over here. The Apple iMac Pro also features the Intel Core i9-7900x but scores lower than its counterpart. 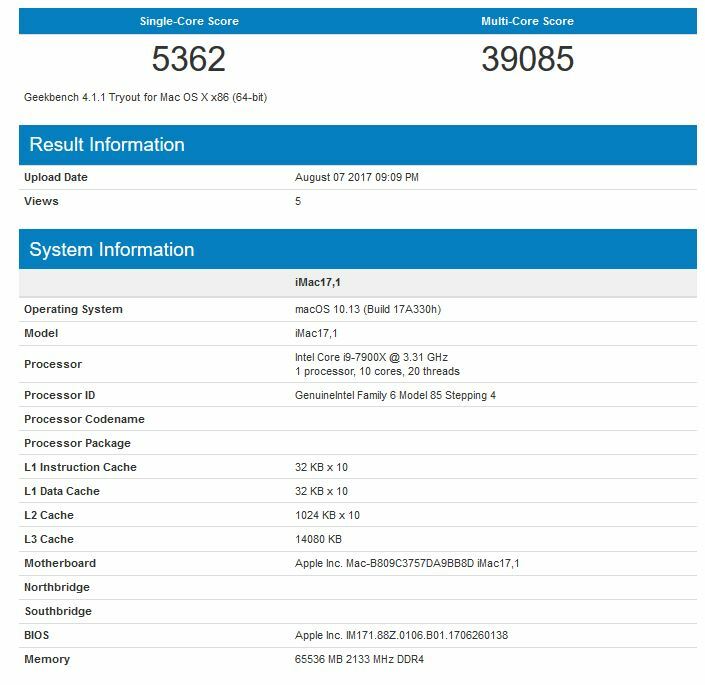 There are two reasons for this, firstly the Geekbench version in question over here is v4, while as the Mac Pro was tested on v3. Secondly, the iMac Pro being an AIO has a much lower thermal envelope which would naturally mean that the chip will have to run at a relatively lower clock to compensate. Since Apple has already promised that the iMac Pro lineup will feature up to 18 cores, we can expect to see the Core i9-7980XE present in the highest configuration once it launches in September. There is still one reason why you should treat this leak with a pinch of salt. Apple has traditionally used Xeons in the Mac Pro and iMac Pro lineups so a benchmark claiming shift to consumer grade processors raises questions on first glance – all of which can be answered easily however. There were two major advantages to the Xeon family before the Skylake-X uArch. Firstly, it featured a lot more cores than even the HEDT side of Intel’s desktop computing was willing to provide. Secondly, it featured exclusive instruction sets like AVX 512. Both of these reasons are no longer valid, since thanks to AMD, Intel’s HEDT lineup now supports up to 18 Cores (Core i9-7980XE) and feature AVX 512 as well – for the first time. This means, that Apple has very good reasons to drop the Xeon lineup as its weapon of choice and finally shift to HEDT.